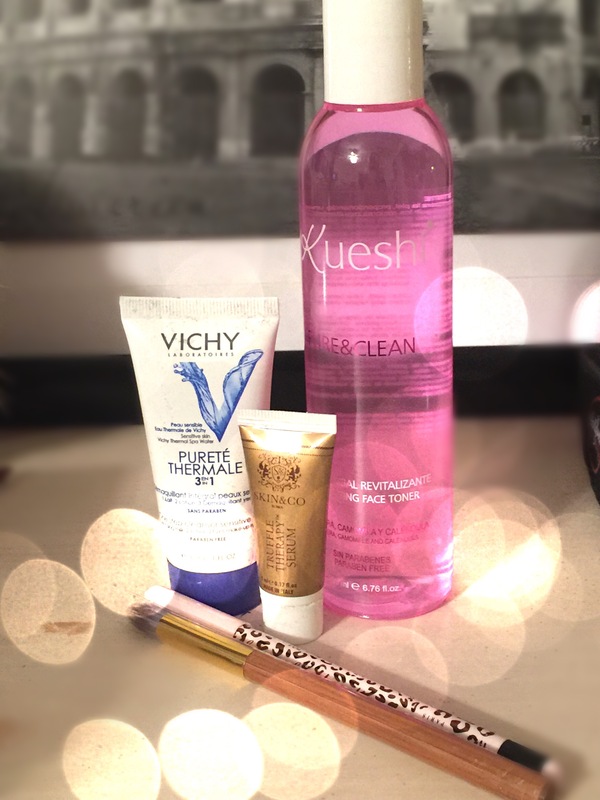 Today I received my January GlossyBox, which I was very excited to receive. I should mention two things: 1) I purchased this box on my own and 2) I have had extremely unpleasant experiences with GB in the past. I was a GlossyBox subscriber for several months last year, and enjoyed the box very much. Eventually though I decided to cut down on my subscription boxes, and decided to cancel for a while. In December I purchased the holiday box (which I LOVED, btw) but it took so incredibly long to ship. After a long back and forth with GB, the box unfortunately arrived after Christmas. I had previously purchased an offer from Ruelala and wanted to use it for the January box because two items caught my eye – the toner and the Tweez Trendy Cosmetics brush. Unfortunately I received the Tarte brush, and while I can use it, it wasn’t what I had hoped would be in the box. (I absolutely love Tarte products, but again, it wasn’t what caught my eye). The first item is the Skin&Co Roma Truffle Therapy Serum. I’m super excited to try this – it has an interesting fragrance. While it isn’t a heavy scent, it may bother some who are sensitive to smells. It absorbs rather quickly into the skin, and I’m excited to use this over a long period of time. The downside is that the full size tube is $80. Next is the Tarte Undercover Bamboo Concealer Brush. Fortunately I could really use a nice concealer brush, but as I mentioned above, is a bit of a bummer. The Kueshi Revitalizing Face Toner was one of the items I fell in love with in another blogger’s review – and it does not disappoint. I adore the fragrance of aloe vera, camomille and calendula. I’m looking forward to using this product and lucky for me, unlike many other GB subscribers, my toner made it completely intact. The Vichy Purete Thermale 3-in-1 One Step Cleanser is new to me. I’m not necessarily new to the brand, but this product is new for me. I love trying new cleansers and believe I will get great use out of this product. The final item in the box, Lollipops Eye Pencil in Goodbye Moon is a new brand for me. I enjoy receiving eye liners that aren’t pencils that I need to sharpen. So I will definitely give this a shot. Plus, being a Jersey girl, I can’t pass up anything pink AND leopard print. In the box was a $40 Hello Fresh gift card. I’ve explored the site in the past and I’m not sure that I’d be their best customer (cooking isn’t quite my forte)… but I’m totally willing to give the service a shot. Overall, I will get use out of everything in the box, and am pleased that I waited for January to use my Ruelala offer.